NEWPORT BEACH, Calif., Jan. 28, 2019 /PRNewswire/ -- Chipotle Mexican Grill (NYSE: CMG) today announced the first class of the Chipotle Aluminaries Project, a seven-month-long accelerator program sponsored by the Chipotle Cultivate Foundation in partnership with Uncharted, both nonprofit 501(c)(3) organizations. The Chipotle Aluminaries Project is part of the company's larger efforts to invest in the future of food with integrity and will drive positive change in the food industry by offering eight growth-stage ventures the resources needed to grow and make a positive impact at scale. Each venture will receive mentorship and direct coaching from world-renowned industry leaders, participate in a boot camp, obtain a special Chipotle card with free burritos for a year, and be powered by Chipotle catering as they take their businesses to the next level. "Since our founding, Chipotle has been committed to cultivating a better world, and we believe the best way to lead the future of food is to inspire others to come along with us on the journey and be a force for good in our industry," said Brian Niccol, chief executive officer at Chipotle. 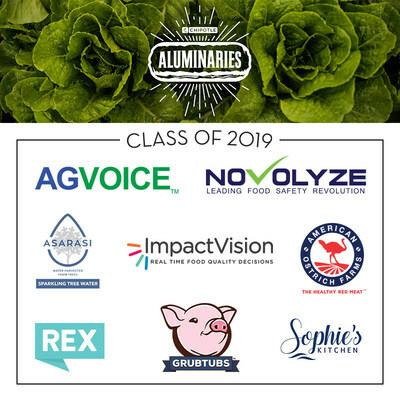 "The eight selected companies represent the best and brightest of what's next in the food industry, and we can't wait to help them reach their full potential with the launch of the Chipotle Aluminaries Project." AgVoice: AgVoice is the simplest way to help farmers measure good stewardship practices by using a mobile voice-interaction service that integrates with existing record-keeping apps. The service enables easy tracking of plant and animal production – at the source – to help assess positive environmental and sustainability impact. American Ostrich Farms: A vertically integrated producer of a better red meat, American Ostrich Farms strives to increase awareness of the resource intensity of food so consumers can make enlightened, healthy choices for themselves and the planet. Ostrich tastes like a delicious, lean filet mignon, but leaves a fraction of the environmental footprint – compared to beef, ostrich uses a third of the fresh water, one fiftieth of the land and emits less than one tenth of the GHGs per pound produced. Asarasi: Asarasi produces a sustainable and renewable water that is harvested from the byproducts of maple trees, offering an environmentally friendly, organic plant-based alternative to bottled water sourcing. GrubTubs: GrubTubs is positioned to be the nationwide solution for food waste. Its product currently allows restaurants, hotels and large cafeterias to drastically reduce what they send to landfills, helping to positively impact the environment. In addition, GrubTubs turns the food waste into insect-based animal feed, which helps farmers significantly lower food costs. ImpactVision: ImpactVision uses hyperspectral imaging to help food businesses deliver consistent product quality, generate premium products and prevent supply chain waste. Novolyze: Novolyze develops innovative technologies to help the food industry manufacture safer food, while ensuring strong compliance with international food safety and quality standards. Its innovative approach to food safety relies on the utilization of cutting-edge microbiology solutions, combined with the latest developments in digital, internet of things and machine learning. Rex Animal Health: Rex Animal Health provides machine learning for a safer and more sustainable food supply. Using data to improve livestock health, the venture is working to reduce the 20 percent waste in animal protein production. Sophie's Kitchen Plant-Based Seafood: Sophie's Kitchen Plant-Based Seafood creates sustainable plant-based seafood alternatives using innovative ingredients and patent-pending technology. In March, the entrepreneurs will participate in a five-day, in-person boot camp in Newport Beach, Calif., where they will create their plans for scale and receive direct coaching from industry leaders including chef Richard Blais and entrepreneur Kimbal Musk, as well as Chipotle executives including Curt Garner, chief digital and information officer; Caitlin Leibert, director of sustainability; Laurie Schalow, chief communications officer; and Tressie Lieberman, vice president of digital marketing and off-premise. "At Chipotle, we feel we have a responsibility and opportunity to forge a path to a more sustainable food future," said Caitlin Leibert, director of sustainability at Chipotle. "Changing the food landscape is bigger than just Chipotle and the Chipotle Cultivate Foundation, and while we are proud of our efforts, we can't do it alone. Together, with these ventures and the entrepreneurs of tomorrow, we know we can make a real impact." The ventures will have regular, one-on-one meetings with their mentors and three to four advisors committed to a minimum of six months of mentorship. In addition to investor readiness training and introductions to relevant investors, the ventures will be granted a special Chipotle card with free burritos for a year, and Chipotle catering for their office to fuel their hard work with real food made from real ingredients. Chipotle Mexican Grill, Inc. (NYSE: CMG) is cultivating a better world by serving responsibly sourced, classically-cooked, real food with wholesome ingredients without added colors, flavors or other additives. Chipotle had more than 2,450 restaurants as of September 30, 2018 in the United States, Canada, the United Kingdom, France and Germany and is the only restaurant company of its size that owns and operates all its restaurants. With more than 70,000 employees passionate about providing a great guest experience, Chipotle is a longtime leader and innovator in the food industry. Chipotle is committed to making its food more accessible to everyone while continuing to be a brand with a demonstrated purpose as it leads the way in digital, technology and sustainable business practices. Steve Ells, founder and executive chairman, first opened Chipotle starting with a single restaurant in Denver, Colorado in 1993. For more information or to place an order online, visit WWW.CHIPOTLE.COM. Chipotle Mexican Grill established the Chipotle Cultivate Foundation in 2011 to extend its commitment to creating a more sustainable food future. The foundation is dedicated to providing resources and promoting good stewardship for farmers; promoting better livestock husbandry; encouraging regenerative agriculture practices; and fostering food literacy, cooking education, and nutritious eating. Since its inception, the foundation has contributed to likeminded organizations committed to cultivating a better world through food. Uncharted is an organization using the DNA of an entrepreneurial accelerator to tackle major social problems like urban poverty and food deserts. Uncharted partners with corporations, foundations, and governments to launch entrepreneur-led initiatives targeted at solving unsolvable problems. Uncharted has helped social entrepreneurs raise $252 million, create impact in 96 countries, and benefit 37 million lives.